There's no way to get around it - renewable energy is the future. It's not only better for the environment in myriad ways, but it's going to be far cheaper in the coming decades, and, you know, it doesn't run out. In fact, several teams of researchers from around the world have shown that in just a few decades, the entire world could be close to entirely free from fossil fuels. While massive solar farms are obviously the most efficient way of getting this done, researchers are figuring out how to get solar power into all kinds of things. Just this week, the world's first 100 percent solar airport, India's Cochin International Airport, announced that it no longer pays for electricity, and the team behind a biofuel/solar-powered plane says it plans to make the first ever carbon-free flight across the Atlantic Ocean within months. It's looking more and more likely that in the future, we could be driving our electric cars on solar-panelled roads to catch our carbon-free flight from a solar-powered airport, and we can't wait to see what that will look like. Maybe we'll even be able to see the incredible, sprawling solar farms of the future from the plane window, and let's hope they'll look like the ones we've listed below. It's adorable, fantastic looking, and so incredibly commercial, but what do you expect when Disneyland decides to build their own solar farm? Currently under construction by Duke Energy Florida near the Walt Disney World Resort in California, the solar farm contains around 48,000 solar panels, all perfectly arranged into the iconic mouse ears shape. 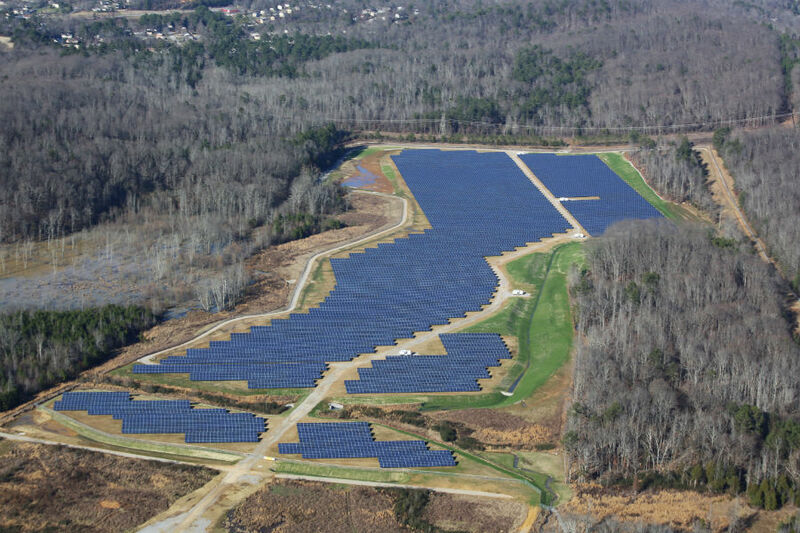 Due to be switched on some time in spring 2016, the Disney solar farm will supply energy to Walt Disney World and the nearby Reedy Creek Improvement District, Mashable reports. Even the most paranoid town in America couldn't knock something as awesome as this back. Located on the southwest corner of the Chattanooga airfield in Tennessee, this sprawling solar plant makes use of space that was unusable for aviation purposes. The giant solar complex brings together two solar farms: Phase I, which consists of 3,948 solar panels with 60 cells each, generating 255 watts per panel, and Phase II, which combines 3,542 panels with 72 cells each, generating 310 watts per panel. The two phases together reportedly produce approximately 85 percent of the airport's energy needs. The Planta Solar 20 (PS20) solar power plant is pictured here alongside its older cousin, PS10. Located in Sanlucar la Mayor, Spain, it once held the title of the world's most powerful solar power tower, until the Ivanpah Solar Power Facility in California was switch on in 2014. The Spanish 20-megawatt (MW) solar power tower was completed back in 2009, and has the capacity to power 10,000 homes. "The plant uses 1,255 mirrors positioned across 210 acres to concentrate sunlight on a receiver mounted on the central tower," National Geographic explains. "Water pumped up the 160-metre (541-foot) structure and through the receiver boils into steam. This steam is used to turn a turbine to produce electricity." From above, it looks like a neat little arrangement of retro video game graphics, but the Topaz Solar Farm that covers part of Carrizo Plain in southern California is serious business. Consisting of 9 million cadmium telluride solar modules that spread out over 5.6 square kilometres (9.5 square miles), this is one of the largest photovoltaic power plants in the world. Switched on in November 2014, the 550-megawatt plant can produce enough electricity to power around 180,000 homes when operating at full capacity. According to Adam Voiland at NASA's Earth Observatory, that's about enough to displace approximately 407,000 metric tonnes of carbon dioxide every year - the equivalent of taking 77,000 cars off the road. As impressive and futuristic as this gargantuan facility looks, it's had its fair share of controversy. Completed in December 2014, the Crescent Dunes Solar Energy Project, located in the desert just outside Las Vegas, became public energy #1 in February 2015, when the intense heat of the initial test runs ended up setting fire to and vapourising at least 130 birds, mid-air. "Over a 6-hour period, biologists counted 130 'streamers', or trails of smoke and water left behind as birds ignited and plummeted to their deaths," Sarah Fecht reported for Popular Science. "Rewire's anonymous source said that at least one of the birds 'turned white hot and vaporised completely.'" Fortunately, researchers at the facility have since figured out how to solve this rather gruesome problem, so we can go back to just appreciating its awesome looks. 6. The 2 MW "Heart of New Caledonia"
The good news is this just might be the most beautiful solar farm in the world, the bad news is it hasn't been built yet. The so-called Heart of New Caledonia is being built by solar company Conergy on Grand Terre, New Caledonia’s largest island. When complete, its 7,888 panels are expected to produce power for 750 homes, saving around 2 million tonnes of carbon dioxide emissions over its projected 25-year lifespan, The Guardian reports. The other bad news? It was reportedly due to be complete some time last year, and we've not seen updates for a long time, so the project could be on hold right now. We certainly hope not, because we all need a heart-shaped solar farm in our lives.